Now you can have a Buddha bot t-shirt that shows a modern version of the classic Buddha. You can get this cool t-shirt in styles for both men and women and it comes in many colors and in sizes Small – 6XL. 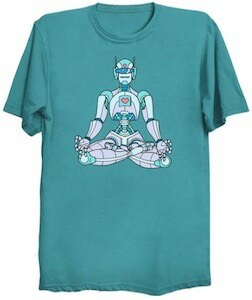 On the shirt you can see a robot sitting in a relaxing yoga pose just like we have see Buddha do. A peaceful robot like this is all that we hope for because it could get a lot worse so many we should all wear this peaceful shirt to shows all the bots that they can be in sync with themselves like the Buddha bot.